Thanks Daniel, I promise not making my comments part of your post. Daniel Listen to your Sayyed taking about the complete revolution all the people (Except Mubarak thugs) and learn who conspired with the Military council hijacked the revolution and betrayed the people and the Sayyed. It is the same people (Minus MB plus fulloul) who occupied the same streets and the same squares to put an end to the sectarian plot. Who is the sleeping giant, Daniel? 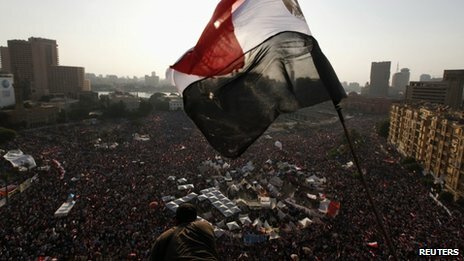 Is it the masses that ousted Mursi? or the it is the MB trying to bring him back. In both cases, both are not sleeping. “People -All People” Every Egyption” Thus said Daniel “the spokesman of Egyptians -All Egyptians”. The NGO’s and the army did it, not all people, and not every Egyptian as the Sayyed claimed. He should know that Satan Brotherhood were not part of 25 Jan uprising. They joined it on Jan, 28th. So, you agree the sectarians and the anti-resistance are the MB. If so why you are calling to turn the page with sectarianists? Again, Nasserists- All Nasserists, you claim, supported the sectarian agenda. Why ignoring that those who elected Muris did that to avoid Mohammad Shafiq. Neither, Nasserists, secularists are the enemy. GET OUT of your Islamist veil. Which Agenda?? Its the the USA/Satan brotherhood aganda. Get it. Why you avoid saying: Hamas isolated itself, by revealing its Ugly sectarian face.? Daniel, please decide, Are Nasserists sectarians or secular? PLEASE TELL US: Who is responsible for the instability, who ignited the terrorist threat or the “so-called “Terrorist’ threat” as you claimed elsewhere? The majority of the Egyptians are not sick of revolution, whether true or not, they see in Sisi a new Nasser. Sisi IS NEITHER NASSER NOR MUBARAK, despite his intentions, he took the right decision in the right moment and responded to millions of Egyptians who took the streets to stop the sectarian iblishood’s agenda. Egypt’s Sisi is at a crossroads, walking in a huge mine field. Egypt can’t refuse the Saudi life support, its hands are tied with camp David treaty, surrounded by the so-called Qaeda/Brotherhood’s terrorist from the west (Libya), the South (Sudan) and the East (Hamas) and the North (Turkey). “the Egyptians do not want this revolution and they are right because it has turned violent and chaotic and has gone out of the hands of the people,. I guess you mean June 30 uprising. Please tell us, who put the people between two bitter choices: Either us for ever, or civil war? And what Egyptians you are talking about? Are they the librals, the left, the nasserists, the qopts etc…? So its done with the Egyptian people blessings after the false flag revolution failed them. Yes its done bu with the Egyptian people’s shoes and Army’s boots after the Iblishood hijacked the Jan 25 uprising and sold Egypt to Satan. This coming together of Syrians and Egyptians is not born of a circumstance on the ground but is born of a peculiar foreign interpretation of the matter and has been parachuted to the media and to the intellectuals which is something we could not understand . When we consider ourselves subject to an assault on behalf of USA and NATO because we are enemies to Israel and refusing to recognize Israel , how could we identify with and recognize those who normalize with Israel? If you tell me that al Sisi has the intention to open Rafah and to do away with Camp David i will tell you : let us wait and see. . The truth is that you know the truth but you are being complacent to people in power . Actually when the orders were issued regarding the change in Egypt , there were massive hallucinations all over the place praising al Sisi and the military coup that brought him to power forgetting that he is Mubarak’s man bringing back Mubarak’s rule.in what was supposed to have been a revolution . Again you Jumped to comment on the wrong place to avoid the videos posted under you comment February 1, 2014 at 1:21 pm. The first Video, shows who promoted sectarianism linked to dissolving the Palestinian cause and recognition if “Israel” as a Jewish state. Haikal’s video was a reaction against Muslim brothers who on June 21 declared the takfiri War on Syria. BTW, is not a pro-Assad, but he believes that Syria is an Egypt’s national security matter. “how could we identify with and recognize those who normalize with Israel?” you asked. HOW YOU IDENTIFY WITH AND RECOGNIZE THOSE WHO DECLARED HOLLY WAR ON THE AXIS OF RESISTANCE??? How you ignore that its not Muslim Brothers who attacked the Israeli Embassy in Cairo? Here you ignore, who kidnapped the “revolution” and sponsored the long truce with Netanyahu, to stop the 8 days war on Gaza, and thus paved the way for June 30 urising. Forget June and Haikal, and listen to Ossama Al-Dalleel of Ahram who visited Syria 5 time before meeting Assad on 12-12-2012. The video you posted about Sayyed has nothing to do with the removal of Morsi , this was the beginning of the Egyptian spring and goes back to Feb 2011 and Sayyed was saluting the Egyptian masses . This is to say that neither Hizbullah nor Iran are happy with the way things have turned and to have Sami Chehab and his friends prosecuted by the Egyptian court as if they were criminals and tracked by the Interpol . Shame! The uprising was kidnapped by MB and the Military council. The dispute is on MB and Hamas, you article is on Egypt. So why shifting the discussion. Shifting the discussion is the tactic of losers. I haven’t Said that Hamdeen Sabahi and others objected or opposed what happening in Syria, and its stupid to expect that from them at that time, the peak of the so-called “Arab Spring”. However, it is unfair to claim that “not one Nasserist denounced what was happening in Syria the ugly massacres. I have seen many, who stood firm against the tide, on Syrian channels, calling Syria the beating heard of Arabisim, calling Syria, the North region of UAR, Calling the Syrian Arab army: The Egypt’s (UAR) 1st Army. Concerning those who “felt that the winds were not blowing in their favor that they changed and shifted position” They are much better that those you defend who stabbed the Syria and the resistance in the back. Concerning, my bias, I am proud of it. Who told you I am neutral ? the peak of the spring cannot be an excuse for allowing what is happening in Syria and Libya also for 2 years , They ( the arrmy and Nasserites )only started showing support for Syria around June when they started rallying against Morsi not before ..The destabilization of the Egyptian society and the demonization of the MUSLIM BROTHERS OF EGYPT IS WORK OF THE PREDATOR WEST., so is promoting the secularism linked to the policies of recognition and normalization with Israel.. Listen to your Mursi, on 15 June, declaring holy sectarian war on Syria and Hezbollah. I am really surprised , it is not that I have invented anything . I did not invent the fact that for 2 years not one Nasserite objected or opposed what was happening in Syria and neither the Egyptian army officers did . . Not one person from the above mentioned denounced what was happening in Syria the ugly massacres , the media lies and so on . And I did not invent that . Is it because they did not want Shafiq to be elected ? What kind of reasoning is this ? They supported what was going on Syria for two full years before saying anything and I did not invent this . It is when the defeat of the opposition became obvious that they felt that the winds were not blowing in their favor that they changed and shifted position . The thing is you don’t want to reason . It is fine I leave you to your bias but talking about the Muslim veil I remind you that I am not Muslim. And if you think that the Egyptian army is a national army and al Sisi is another Nasser , there is nothing I can do for you . I wish it were so myself , but it isn’t .